"What do you want to create in 2015? Get better at what you love to do and save up to 50% off popular online Craftsy classes for this weekend only. (35+ new classes included!)" We all know getting ready for Christmas can be very hectic. Well believe me when I say that when you travel, it becomes more than hectic. At my house this year, I had a frantic one day to get prepared for Christmas. I had a few gifts to make and had exactly 24 hrs to get them completed. My dad had asked for hats for a Church function he participates in, so I thought..no problem, put that hat hoop on and go for it, right???? Not so much. I put the hat hoop on, hooped the first hat, ran the design and no problem it is done and looked great. So here I go with the second one. I am getting super fast at this by now. This one is a little heavier weight, a denim hat, I hoop it up, put it on the machine and my machine is struggling to get it done. Now I am on a PR1000e and it can go through almost anything, but I think to myself, maybe the fabric is just too thick for my needles. I had 75/11's in the machine. In the back of my head, I could hear Paulette Bell telling me you never need a 90/14 needle in this machine, but my machine was really thumping. So I switched out the needles. Well the machine ran beautifully after that and finished the hat without further issue. When I took the hat off, I had to laugh at myself. Sometimes you just have to! 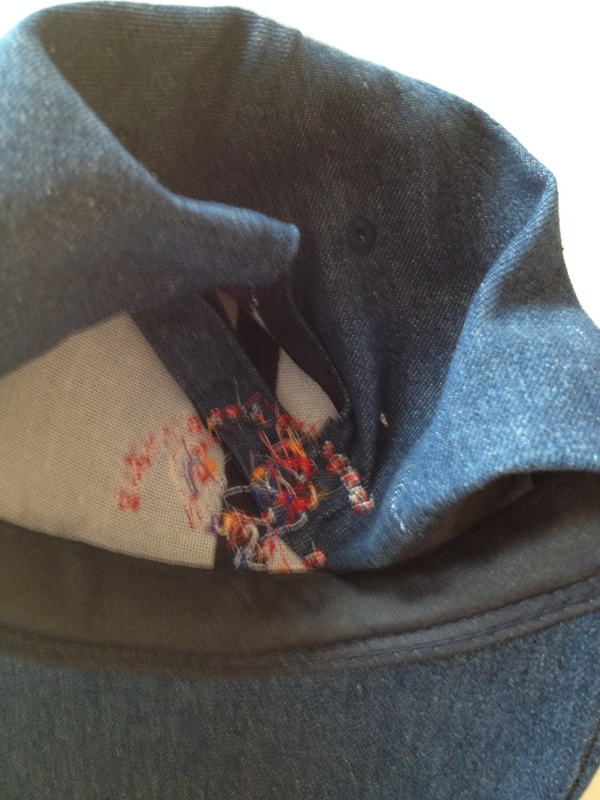 I had completely sewn the back of the hat to the front over the Velcro closure. I don't know how I managed to get that sucker caught, but I did indeed. Moral of the story....If your machine is struggling, check and make sure you don't have something caught under the frame that isn't supposed to be stitching. I stitched through 6 layers of denim and 2 layers of Velcro. Boy that machine can stitch through almost anything! Have fun and enjoy a laugh on me today! The Knowing in Sewing Newsletter was mailed last night. I have made up for missing the last few. You will find 6 tips and a link for a thread chart that can be imported into PE-DESIGN 10.